Harri Salo has been appointed After Sales Engineer at Galvatek. In this position he serves as the primary contact for customers looking for spare parts for their surface treatment plants. “I have been studying and working in spare part operations for decades, but this job has the broadest description so far. It feels good to have total responsibility for the entire spare parts process, from purchasing to delivery,” says Harri Salo. Salo previously worked in spare parts and service operations at Kempower, Finnsonic and Kemppi. Kempower supplied electrical power sources to Galvatek, while Finnsonic fabricates ultrasonic washing lines and non-destructive testing devices, so Galvatek was already familiar to him. His latest job was at Kemppi Oy measuring and analysing power electronic components. 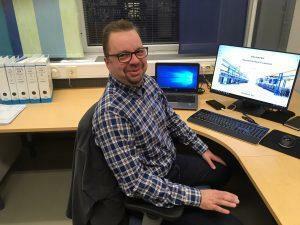 Salo graduated with a degree in Automation Engineering from Lahti University of Applied Sciences and later earned an MSc in applied electronics and electrical drives from Lappeenranta University of Technology. He lives in Lahti with his wife and likes to spend his leisure time outdoors hiking, boating, motorcycling and staying at his summer cottage in the countryside. Galvatek warmly welcomes Harri to our team! Galvatek has signed a contract to deliver a phosphating line, painting line, waste water neutralization plant and robotized material handling system to a manufacturing facility in Finland. Galvatek delivers the full turnkey project including design engineering, installation and commissioning. The size of the project is approximately three million euros. “The competition was extremely tight. Galvatek was chosen because of our ability to manage the surface treatment plant, painting line and material handing solution as one turnkey project. Galvatek´ s long experience in this kind of projects was also appreciated,” tells Sales and Marketing Manager Tommi Rautiainen, Galvatek Oy. The project will be executed in partnership together with Sasmetor (www.sasmetor.fi) and Orfer (www.orfer.fi), who as Galvatek subcontractors are Finnish technology professionals in painting lines as well as robotics solutions. The new project is a positive signal expressing growth of industrial investments in Finland. For Galvatek the recent project means another remarkable delivery to Finnish industries, following the deliveries of two fully automatic tin plating lines to Ouneva Oy in Finland in 2013 and 2016. The name of the customer is not published because of the customer´s wish. We are looking for an Automation Engineer located in our office in Lahti, Finland. You will be part of Galvatek´s project organization. Your task is to take care of automation in certain projects from planning to the execution. Your task is planning, programming and commissioning of automation for Galvatek surface treatment plants. This includes customer training and support. We expect you to be positive and inspiring team player who enjoys to interact with clients and project team. To succeed in the job you need to have technical education, know-how of industrial PC and PLC control software and couple of years working experience in similar tasks. We also expect you to be ready to travel when necessary. Your English and Finnish language should be fluent, other languages are counted in as an advantage. We offer you a chance to travel internationally and to work with people from other cultures. Galvatek is a truly international company and majority of our sales has been export already for many decades. More details and applying for this job can be done here (in Finnish). For additional questions about the position, please contact Mr. Jari Lehtinen, General Manager – Automation & Service, +358 3 526 6658 or jari.lehtinen(at)galvatek.fi. Please apply by email by sending your application, CV and other attachments to jari.lehtinen(at)galvatek.fi by 12 November 2017.
deserved retirements, none is more well-deserved than Hannu’s! I have worked as designer, installation supervisor or project manager,” Hannu tells us. Engineering, where work really began on developing surface treatment technology. “When people asked me where I worked and I said at Galvatek, no one knew what we do. Galvatek lines. He returned to Galvatek in 2004.
days without work. Bonuses make up for any time off that I lose,” Hannu explains. customers all over the world. to reserve a phone call to Finland in advance once a week or so,” Hannu remembers. Galcont control system, which Hannu praises. companies in transferring this knowledge to new employees. team spirit and I know that the others can do their jobs,” Hannu admits. retired employees. What is for sure is that Hannu won’t be bored after he retires. have four grandchildren to keep me occupied!” Hannu laughs. Galvatek is an engineering company, based in Lahti, designing and supplying Surface and Water Treatment Plants. We have operated in international markets for over 35 years, and currently 80-90% of our turnover comes from export. Galvatek’s main customer groups are in aviation and aluminium industry as well as in more traditional industries such as metal working and engineering. Our main market areas are Europe, Middle-East, South East Asia, Japan and China. We are a team of 25 industry professionals and our turnover is 12 million euros. Galvatek is providing after sales support and preventive maintenance service to its international customers. Important part of after sales in this position is to support our customers from our back office with spare part deliveries as well as service quotations. Tasks also include project logistics coordinating, purchases and total management of the spare parts supply chain. Additionally, the coordinator has also important role in our project documentation preparation. 5-10 years working experience in industrial work, preferably in sales or purchasing activities. We have an ambition to fill this vacant soonest possible. Please send your application, CV and salary expectation by 25.08.2017. The event is the only one in the UK dedicated to surface treatment, product finishing and coatings industry. Galvatek joins the event together with our local partner Turbex Ltd. Come to Birmingham and meet us at Stand D1 at Hall 7. Galvatek was awarded ISO 9001:2015 quality certification by Bureau Veritas on 18 January 2017. The new certification marks a logical continuation of Galvatek’s long-term focus on quality. “We have had an excellent internal quality system in place since 1993. Applying for ISO 9001 was a way of obtaining independent certification for our existing quality systems and working methods,” explains Ulf Pråhl, Managing Director of Galvatek. ISO 9001 certification facilitates cooperation with customers and partners. Previously, presenting Galvatek’s own quality system and the audits conducted by partners took up a lot of time. The new ISO 9001 certificate explains unambiguously that Galvatek complies with specific quality criteria. “No real changes were needed in our quality system or working methods, but everything had to be documented as required by ISO 9001. The only actual change is that more detailed notes of internal meetings will now be kept. Since we are a relatively small organization, a lot of things used to be agreed verbally,” Pråhl says. Pråhl emphasizes that quality has always been an integral part of everyday operations at Galvatek and not just theoretical text. “Our approach has always been to make sure that our working methods are in order and then document them in our quality system and not the other way round. This ensures that quality operations are routine and that there is no panic to make changes right before each audit,” Pråhl adds. Obtaining ISO 9001 quality certification was an unusually straightforward process for Galvatek, also from the auditor’s perspective. “Galvatek had a very mature quality system, and all the groundwork had been done very well. The process took half a year, and Galvatek passed the actual audit on the first try without any deviations,” says Lead Auditor Antti Reijonen of Bureau Veritas. Airshow China in Zhuhai, Guangdong, gathers together the most important players again this year in Chinese aviation market. Galvatek and FinnSonic are participating the event for the first time with our joint concept CE4MRO, together with our local partner Great Harvest Science & Technology, GHBJ, Beijing. Come and meet us at the most important aviation event in China, at November 1-6, in Zhuhai, Guangdong.